Uploading a video is the first thing for any YouTuber. But while vlogging any content, the quality of your video matters a lot. Most of the video that is uploaded is terrible due to low quality. It's really irritating to see such videos. Who will like the video that doesn't even look good & not so clear? Even if you have an excellent content & concept but low-quality video, then it will affect the likes of videos & numbers of subscribers of your channel. To maintain a strong presence & to get more subscribers to your channel one of the easiest ways is to maintain the quality of videos. Today you will get some vlogging tips to make your video high quality. Making videos professionally is not as complicated as it appears. If you have basic accessories of shooting, then you are ready for this. You just need to know how to hold a camera & some basics of filmmaking. Don't worry if you don't have any background of this; you may just go through this & I'm sure that this will help you & improve your view count. The best thing is that you don't even need a big budget. There are two main parts for video making; first includes all setup, camera, light, etc. & other involves editing part. If you manage these two things, then you will surely master in video shooting. So make high-quality videos & become popular & recognized for your video quality. Having high-quality video will undoubtedly increase your subscriber, & obviously helps you to make money with Youtube ads. 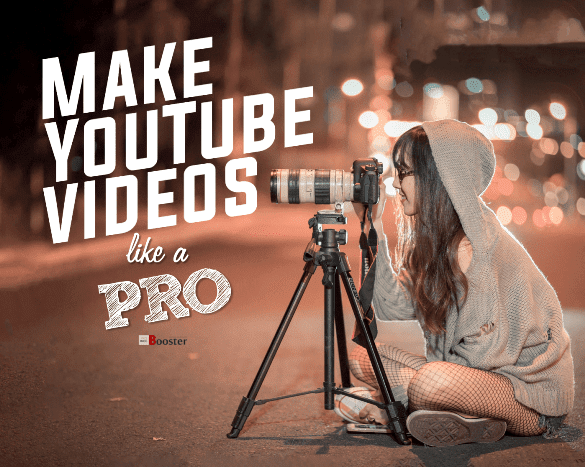 And today you are going to see most important and essential tips for creating high-quality professional videos for your YouTube channel. 1. Equipment required to create quality Youtube videos. The most obvious thing that you require is the camera. You need a camera with high-quality features. It's not necessary that you must have 1080p video recording camera. You can get the professional look even by using 720p recording camera. Just have a look at lighting & audio of the camera, which is enough. If you use HD cameras, then it would be well & good & if you are thinking to buy a new camera, then I'll prefer to go for DSLR. It is the best option for you. It will give you cinematic effect, versatility & creativity. 2. Proper audio equipment required. The sound quality of your video matters a lot. If the sound is low, distorted & they can't hear what you are saying then most probably, the viewer will move from and switch to another video. The viewer can make adjustments with your video quality but not with the sound. You can use lavalier microphone (a small microphone used for TV, theater shows, etc.) if your camera has mic jack socket. Spending money on the microphone really worth as it records audio with high-quality that ranges from 40-450kbps. It removes almost all noise. Other options for lavalier microphone are USB microphone, a portable recorder, a shotgun recorder. But don't be dependent on just camera microphones because they don't have pretty audio quality. Many of you might don't have this much of budget, & you record with your smart phones then you should record video & audio with different smartphones & match them on editing. This trick works good & you can feel the difference once you made it. 3. You must know lights and lighting equipment for Youtube. Make sure that you don't make a distracting shadow in a video. You can also buy a Light kit which at least consists of flood lamps, spotlight, stands & reflectors. But many people who don't use light kit just keep one main light & complete whole shooting in that one direction light. This causes shadows, & affects the quality of the video. Using a combination of lights rather than using only one main light gives much better effect. So that in your video there would be three parts of your light. First of all fill light, which will be set in front of the object. Fill light should be behind & slightly from the camera. The second one is primary light. It is set 45 degrees with respect to the object. Leading light must have more intensity than fill light & last is background light. This will help you to illuminate the background & avoid distracting shadows of objects. This set up will help you to make your video look mare natural. 4. Better video editing: perspective/rule of thirds. Having a perspective mind & direction to your video makes it different than others. Many people keep the main object in middle or center of the frame. But don't make this mistake in your video. Use the rule of thirds to make your video more professional. I'll explain this rule in very simple manner. Rule of thirds says that never place object the center of the frame. Imagine that your picture frame is split into nine parts. So that there will be 4 intersecting points in the frame. So just make sure that your object does not occupy 2 or more intersecting points at the same time. This makes the well-balanced frame of the picture. Never forget this rule because applying this rule in your picture frame will make you more professional. 5. Custom white balance for better video. If you start recording, you might observe that picture that you record is yellowish. This is because of the color temperature. It changes with respect to time; an hour of the day also depends on the light source. Just check the white balance wherever you start shooting. Most of the cameras have a color temperature or white balance option even if they, not professional cameras. Easiest trick to set white balance is that; take a sheet of white paper, if it appears white in camera frame then the color temp is alright. If not then adjust the temperature according to it. 6. Basic setup for filming Youtube videos. Every professional YouTubers pay attention towards the background. If you are going to shoot outdoor, then choose the right place. The background should not get more attention than the main object & it should not be boring too. If you are planning to shoot indoor, then you must think wisely. For blank clean background, you must have a backdrop background. Otherwise, you can add elements to the background related to the topic of your video. 7. Steady shoot & fix shaky videos. Make sure that whenever you shoot anything, it must be steady. Apparently, if your camera is not stable & things move up & down in your video, any viewer will definitely leave your video. I personally hate such videos because they give feeling like a horrible roller coaster ride, & irritate a lot. Professional video maker will never make such mistakes. Use a tripod or even a stack of books or something like that. You can also use devices like steady cam so that you can walk, move without shaky footage. This is a really important point this will definitely make your video more professional. 8. Edit videos for YouTube. Editing is the last step before uploading your video. There are many editors available free as well as paid. Windows movie maker is an inbuilt with Windows PC. Try to make your video pro & edit it whenever it is needed. Use various suitable effects; add titles to make it attractive. But make it in a limit otherwise too many titles & effects may irritate a viewer. If you have recorded video with jump cuts, then edit unwanted portion. & make video ready to upload. 9. Write a script for your Youtube videos. Be sure about your ideas that you are going to use in the video. Write a compelling script before shooting. This will make well organized & professional video. Trust me unscripted video actually creates a bad impact on a viewer. Practice makes man perfect! So guys keep practicing. This practicing will surely make your videos more professional & skillful. You will see the difference through every video. Every time you make a mistake you learn something new. Try to make videos with different techniques. Also, make sure that everything all okay. Check out the camera, lights, light angles, framing, color balance, background. Make a good preparation then half battle is already won. I hope this article would help you. Use tips as mentioned above in your next video & I'm sure that you will see some different results. And also try something new concepts & ideas for shooting. Plan all things very well before shooting so that you will avoid mess & make things all perfect. Within a small budget, you will do great. So don't forget to use these tips & wish you very all the best for your next video. If you know any better idea to add into above list, then let me know. Do share this post, like and subscribe our newsletter.